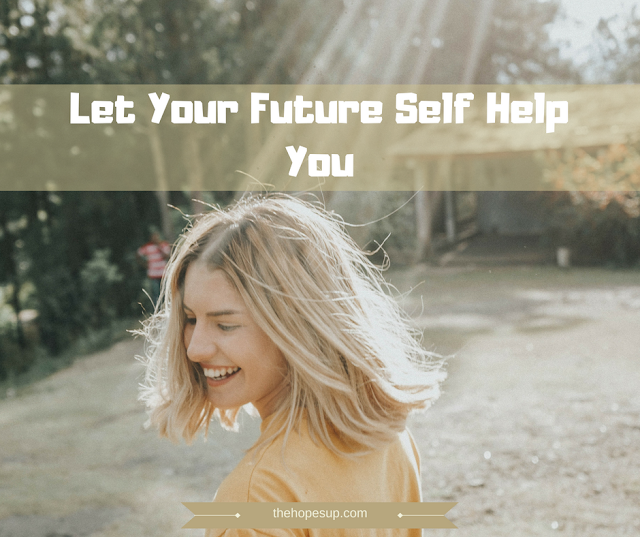 Whenever you feel too overwhelmed by the unpleasant situations in your life or feel stuck and demotivated, try to think about your future self - the version of you that is more experienced, more focused and more accomplished than the present you. Imagining your future self, who is everything you have ever wished for, allows you to get through the tough situations in your life and become able to achieve everything your future-self has. Thinking about your future self helps you to look at the bigger picture. It prevents you from getting too deeply affected by the negative experiences or giving up on your goals. Your future self can motivate you in unpleasant situations. The future you, a happier, more confident and successful version of the current you can motivate you to make the right decisions which will infuse that happiness and confidence in the present, setting you on the right path. No matter how hard it seems, do not give up. Keep working on yourself and your goals. Your future self will thank you for the persistence you showed in hard times, the efforts you made in the present to make it stronger and more perseverent in the future. Everything you do now is going to affect your future self. Working on your smaller goals each day will result in the completion of your bigger goals in the future. Thinking about your future self allows you to stay on track with your goals. The accomplishments of your future self depend on the efforts you put in now. It is important that you stay on track with your goals and keep growing constantly. Thinking about your future self can immensely help you in beating procrastination. Your future self is indeed you and slacking off in the present is only going to negatively affect you in the future. This realization is going to help you to work efficiently and eventually accomplish all of your goals. Regularly evaluate your skill sets and keep improving them to make sure they are in sync with your end goals. Keeping your future self in mind will inspire you and allow you to effectively work on the process of becoming the best version of yourself. Your decisions and actions in the present determine your future. Be mindful of how and where you spend your time and energy and make the right choices to ensure that you actually become the desired version of your self in the future. We all have certain goals set for ourselves, a vision of a life we desire and a version of ourselves that is mostly free of flaws. And thinking about your future self is a great way to stay on track with your end goals and actually achieve them. What about you? What does your future self look like? Are you taking the necessary steps that will bring you closer to your future self?